Ethan Coverwood, Matilda's nephew and a friend of Kaitlin, is on a diplomatic career path of his own. When the two are assigned to posts in Saudi Arabia during the Gulf War, something more than friendship begins to brew. But will it be strong enough to unite two people who could be reassigned to different continents in the blink of an eye? Enough for Ethan as he struggles to carry out America's policies in a chaotic world? For Kaitlin as she agonizes over the desperate people she meets in her duties? A courageous love. A reawakened passion. A vibrant step of faith. By the acclaimed author of Singing in Babylon, Quiet Deception, Searching for Home, and Distant Thunder. The background for many of Ann’s novels is based on her experiences as a Foreign Service officer for the U.S. Department of State 1990 to 2004. Her posts included U.S. embassies and consulates in Saudi Arabia (twice), Algeria, Canada, Tunisia, and Washington, D.C.
She’s been writing full time since 2004. 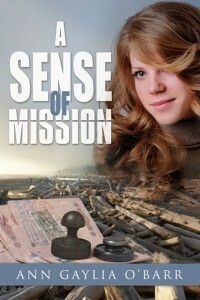 OakTara has published Singing in Babylon, Quiet Deception, Searching for Home, Distant Thunder, and this novel, A Sense of Mission. Q. You say you write “global fiction.” What is that? A. Such fiction suggests writing from a global viewpoint. Characters in my stories are American Christians who struggle with personal faith issues, fall in love, and deal with family problems as in other fiction. In the midst of these conflicts, however, they understand Christianity as Jesus-centered for the whole world. Often they have global jobs: journalists, teachers in international schools, or jobs abroad for the U.S. government, as I had. They learn the value of their faith in countries where Christianity isn’t the majority faith. Others have written "global" fiction as well. One I'm thinking of is Davis Bunn's recent Lion of Babylon. It gives insight into the life of Christians and others in Iraq today.